Please limit each order to 2 bottles. Large 64 oz jugs for $10.00 can be picked up at our Farmer Market locations. This cider is such a refreshing and delicious drink that will surely quench your thirst. Serve it cold in the spring/summer season and serve it hot in the fall/winter season. 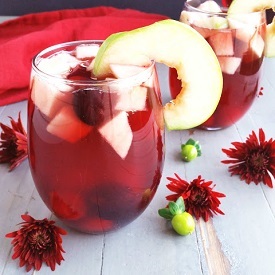 Having a party, our Black Bing Cherry Cider makes a delightful Sangria for your guests to enjoy. Replace the sugary soda with our No Sugar added Black Bing Cherry Cider.